A. Accommodation is arranged in 3 or 4 Star hotels with restaurants and shops in walking distance. This accommodation is compulsory for all participants of the 8th World Health Qigong Tournament and Exchange and 4th World Health Qigong Scientific Symposium. 1. 4 Star hotel: Twin share: US$105/day/person including tax and breakfast. Single room: US$185/day/person including tax and breakfast. 2. 3 Star hotel: Twin share: US$85/day/person including tax and breakfast. Single room: US$165/day/person including tax and breakfast. 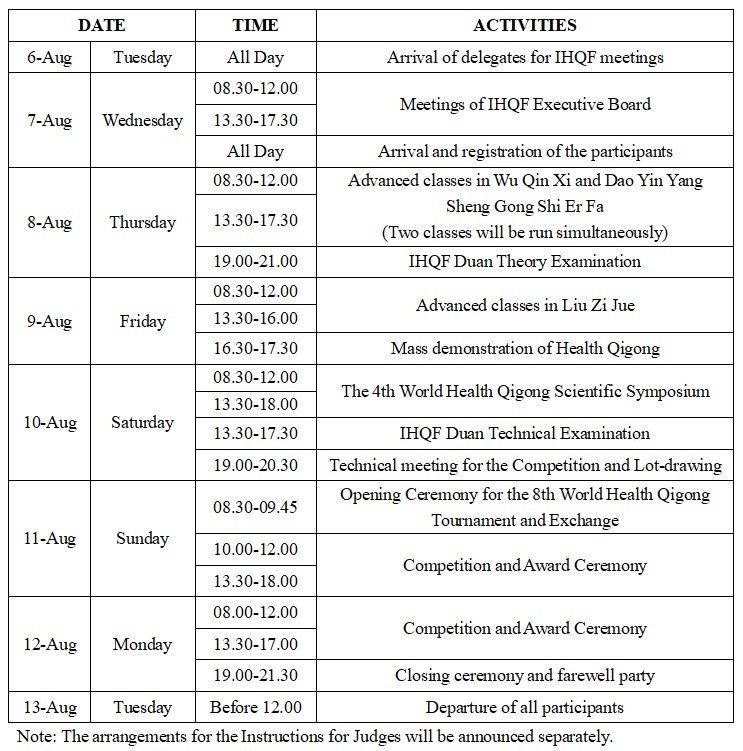 US$100/per person/per class for members of IHQF member organizations. US$120/per person/per class for non-members of IHQF member organizations. 1) Group competition: US$15/team/event/person for IHQF members. 2) Individual competition: US$20/team/event/person for IHQF members. 1) Group competition: US$20/team/event/person for IHQF members. 2) Individual competition: US$25/team/event/person for IHQF members. To be charged as prescribed in the International Duan Evaluation System for Health Qigong. US$85/per person including Beer, Wine and Soft drinks. A. 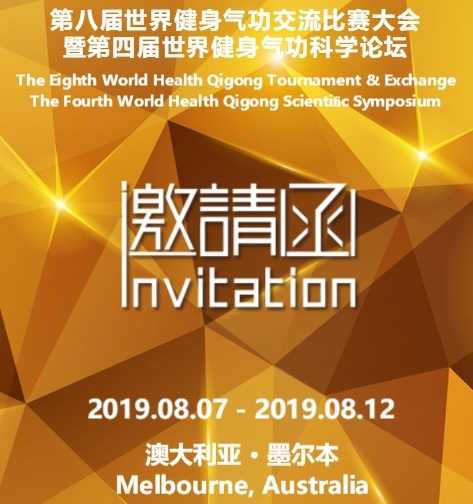 Member organizations of the International Health Qigong Federation and other non-member organizations are kindly requested to complete the attached forms as required and send by e-mail or Mail to Tai Chi Australia. B. Deadline for registration and full payment is 24:00 on July 15th 2019(Melbourne time). No late registration will be accepted. All participation fees must be paid when registering. C. The Organizing Committee shall provide transportation for participants between the airport and the accommodation on Registration Day (7th August) and Departure Day (13th August). More information will follow soon. 1. Each delegation must submit the Original of the Entry Forms and 1 copy of the Participants’ Responsibility Statement to the Organizing Committee. 2. Participants must purchase their own Life Insurance and provide evidence on registration. The delegation and/or the individual must undertake responsibility for any illness or injuries occurring during the events. X. Matters not mentioned herein will be advised later.